In downtown Jackson, steps from shops, art galleries, theaters, restaurants, urban parks, and the Town Square, iconic for its elk antler arches, Hotel Jackson is as authentic as it is stylish and memorable. 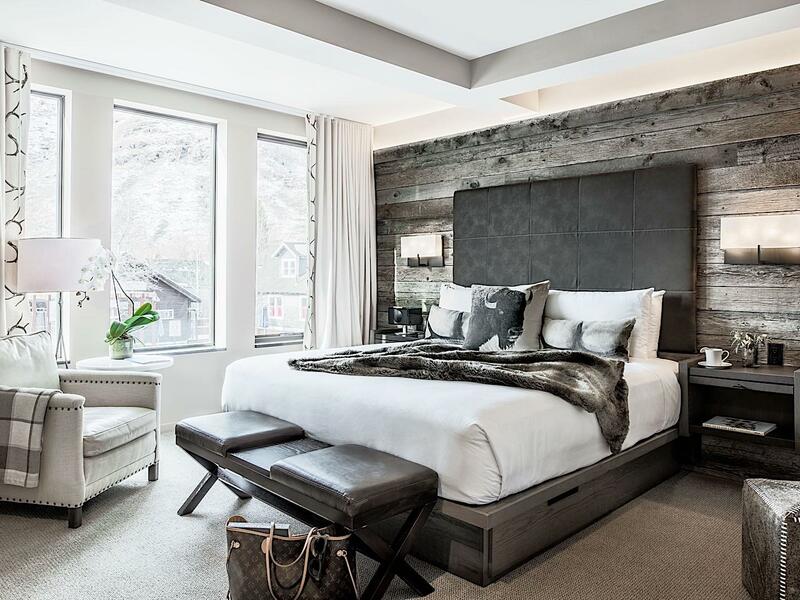 Owned and run by a family that has lived in the valley for more than four decades, Hotel Jackson’s expansive public spaces and 55 guest rooms and suites thoughtfully blend old (reclaimed barn wood, stone) and new (steel, concrete) materials with contemporary artwork from the valley’s many galleries. 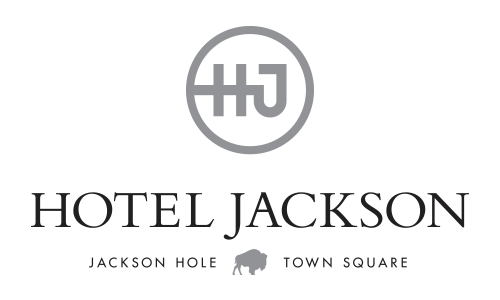 Hotel Jackson’s goal is to celebrate Jackson Hole’s unique Western heritage, while providing guests every modern luxury, and also unrivaled customer service. As gorgeous and welcoming as Hotel Jackson is, we know we’re but a base camp for you to experience one of the most wild and intact ecosystems in the world. Grand Teton and Yellowstone National Parks, and the national forests and wilderness areas surrounding them, are home to diverse wildlife, geologic wonders, and open spaces. Hotel Jackson enjoys an urban location (for Wyoming, the U.S. state with the second lowest population density) where cafes and boutiques are right out the front door. Still, the southern entrance to Grand Teton National Park is only a 20-minute drive. Yellowstone is one hour from our front door. Jackson Hole Mountain Resort, consistently rated as one of North America’s top ski resorts, is also about 20 minutes away. So, hike, paddle, fly fish, ski, snowboard, snowshoe, mountain bike, and watch wildlife in an unparalleled setting all day and then come home to Hotel Jackson and relax with a glass of wine in front of the fireplace, in our award-winning restaurant FIGS, or on your private deck. Or maybe soak in the rooftop hot tub. However you want to spend your time in Jackson Hole, Hotel Jackson’s owners and staff have the knowledge and the desire to assist you in making the most of your time here. Get ready to be indulged and surprised by the Hotel Jackson dining experience. Offering award-winning cuisine at any time of day, our FIGS and Smokin’ Iron restaurants delight Jackson Hole locals and hotel guests with innovative Lebanese-Mediterranean cuisine and handcrafted cocktails in a pair of sophisticated yet inviting settings. Jackson Hole. Its infinite landscape of unforgettable things to do conjures many visions not only for those who have explored this pristine valley, but also for those who still have it on their bucket list. Epic, world-class fly fishing and skiing, breathtaking Grand Teton and Yellowstone National Parks, mesmerizing wildlife, the wild west, cowboys and endless hiking experiences are just a few of those visions. 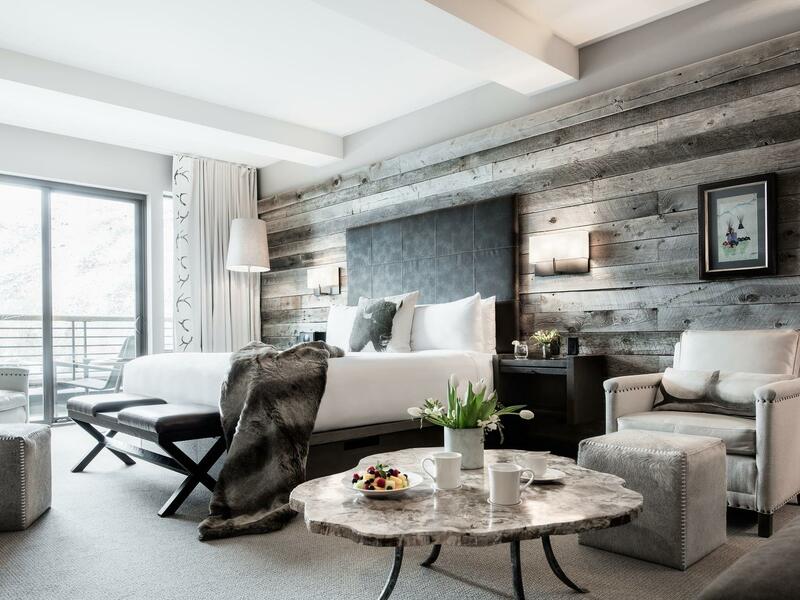 Renowned for its contemporary-meets-rustic design, stunning interiors and ultra-luxury accommodations and amenities, Hotel Jackson is one of the finest hotels in Jackson Hole. Check out our photo gallery to see why we were named “The Most Beautiful Hotel in Wyoming” by Architectural Digest Magazine. Welcome to your Jackson Hole retreat. 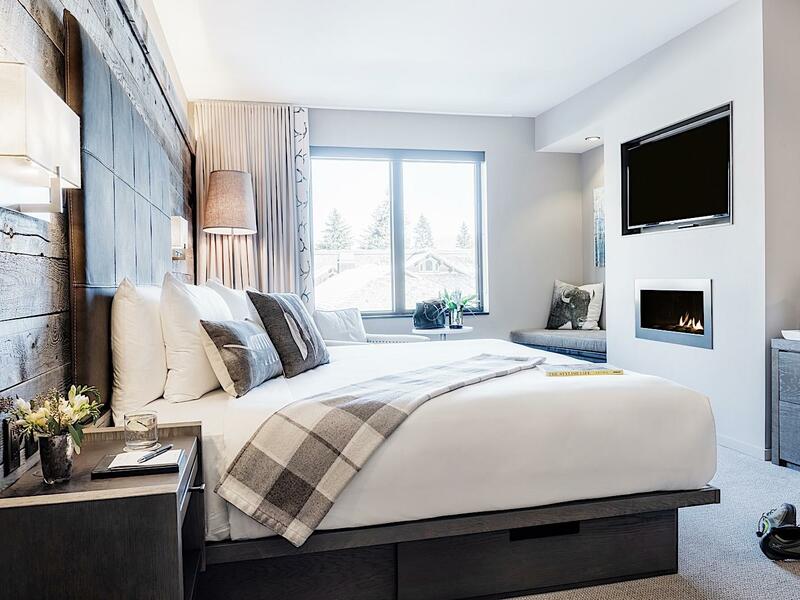 Our Superior Guest Rooms are available with King beds, luxurious triple sheet bedding, ample closet and storage space for hiking and ski gear, a gas fireplace and a beautiful spa-like bathroom with a large shower. Rooms also include in-room safe, mini-fridge and Nespresso coffee maker. Welcome to your mountain home retreat. 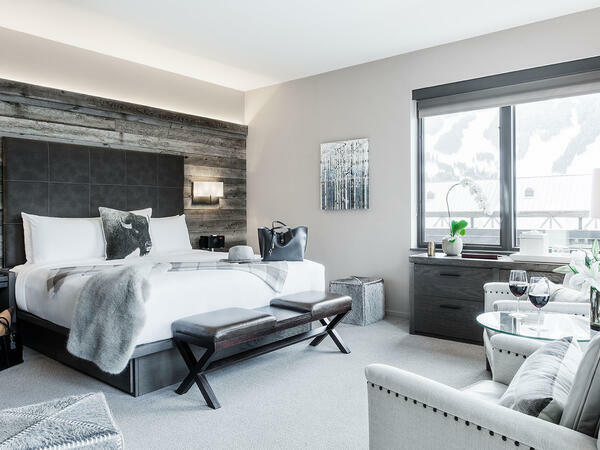 Our Guest Rooms are available with a king bed, luxurious triple sheet bedding, ample closet and storage space for hiking and ski gear, a gas fireplace and a beautiful spa-like bathroom. Rooms also include in-room safe, mini-fridge and Nespresso coffee maker. Premium rooms have views of the town of Jackson and surrounding mountains. 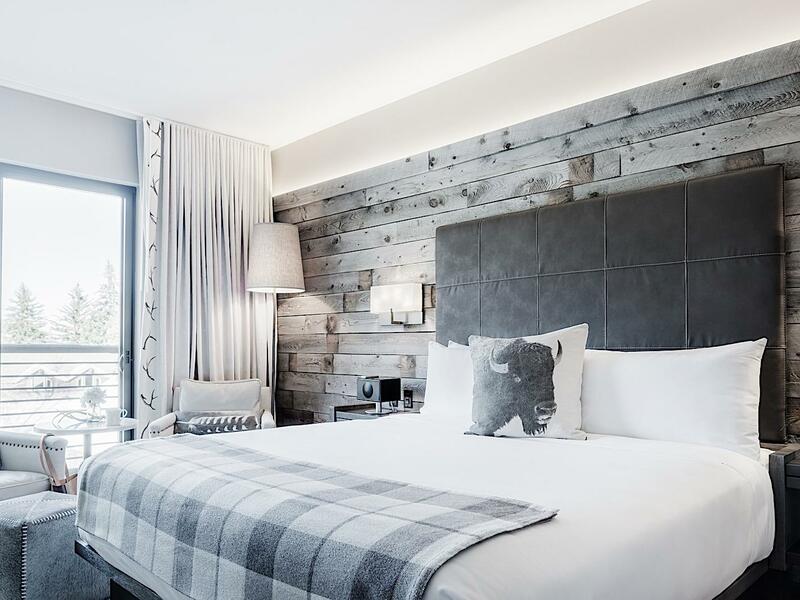 In the early 19th century, Jim Bridger was the consummate frontiersman and mountain man, but our ADA-compliant 750-square-foot Bridger Suite is anything but rough. On the property’s top floor, this 500 square-foot suite features a 250 square-foot wrap-around deck and outdoor natural gas fireplace. Like our other suites, our largest suite is named for someone important to the valley’s history. Davy Jackson was the mountain man and fur trader Jackson Hole was named after. 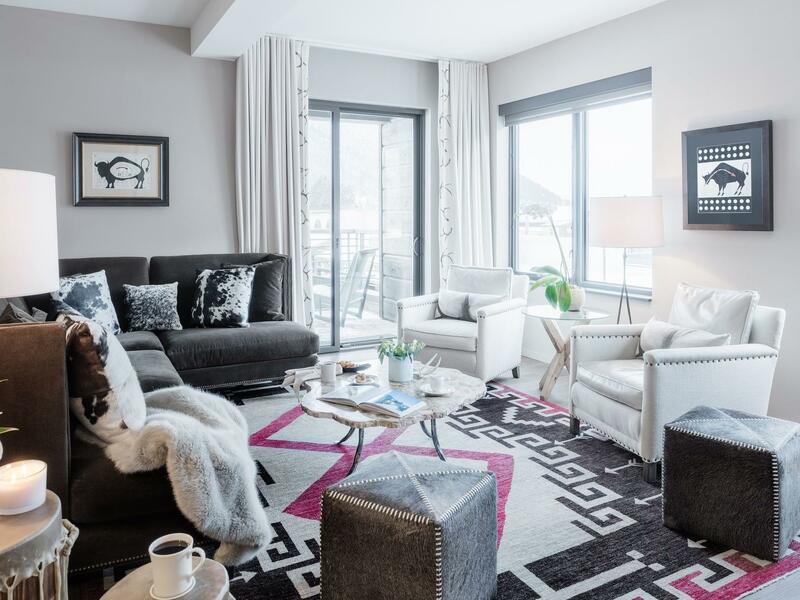 Extensive natural light and two patios make the two-room, 1,000-square-foot Colter Suite shine.